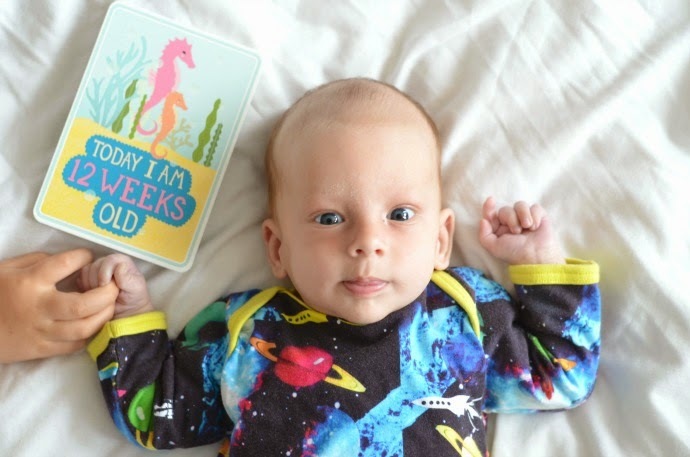 3 months is meant to signal the end of that newborn phase and the beginning of just being a 'baby', but I think Finn is reluctant to leave behind the term new baby. After another hospital admission due to his weight we seem to be back on track and at 13 weeks he weighs 10lb 11oz. He has been diagnosed as dairy intolerant and cutting out cow's milk has made such a difference to our dinky dude. He is like a new baby, so much happier and more content now that he doesn't have what must have been a constant tummy ache. Now that he isn't so unhappy, he is really trying to learn new skills and he is lifting up his head much more when he is on his tummy. His neck is generally getting stronger, although he still needs some support. He has started reaching out to bat things and seems to enjoy his bouncer chair so much more because of it. He still hasn't got much control over his hands, but I can see the connections forming in his brain. He has definitely found his hands now though, and they are most often in his mouth. I don't think he is teething but just exploring his body. Finn still loves being in the sling, unless it is windy and then he much prefers to be tucked up in a pram. We have discovered that my mum has an old musical toy that he loves and he seems to enjoy the Lego Movie theme tune too, after all, everything is awesome! Sleep has been up and down, on a good night he can do an 8 hour stretch, on a bad night it is 3. He wants to go down to bed between 6 and 7 so I don't really get to appreciate this sleep as by the time I go to bed he is usually waking up for milk and it is every 2.5 hours from then onwards. We have finally cracked out the 0-3 month clothes, although a few bigger newborn sized bits still fit. He seems to be all limbs and whilst things fit in the body he is sporting 3/4 length sleeves and bare ankles, hopefully he can wear short sleeves over the summer whilst his body catches up! These three months have been so hectic but I am hoping this next month is one of calm and growth. 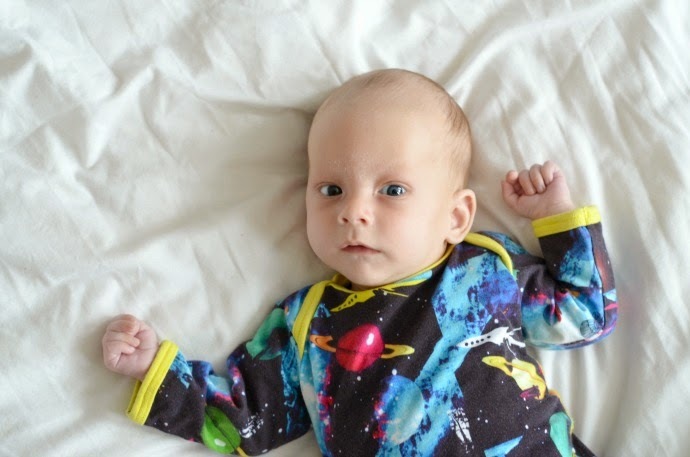 Aww he is growing so quickly, what a cutie and gorgeous babygrow. I like the handy little card to keep track of his age!